Have you or your family been affected by Parkinson’s disease? More than 100,000 Canadians live with this progressive neurological condition, and more than 25 people are diagnosed each day. Researchers do not yet know the causes of Parkinson’s, nor is there a cure. The average age of onset is 60, but some people are diagnosed in their 20s, 30s or 40s. 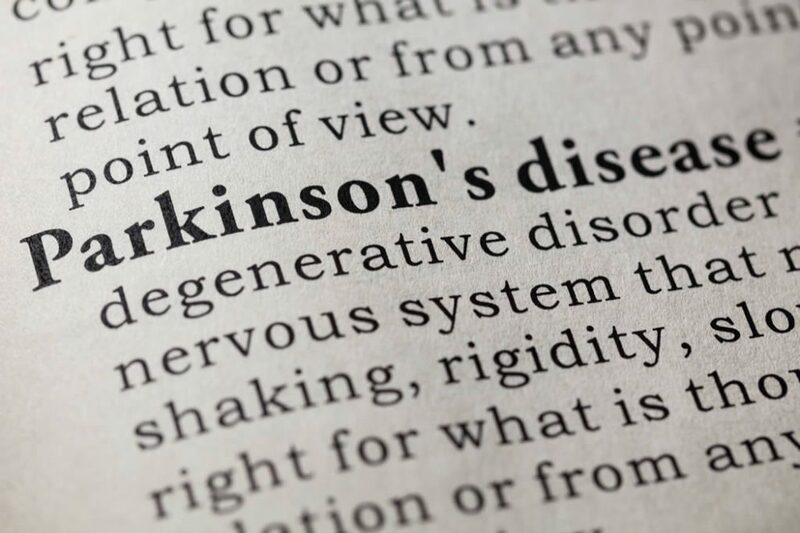 Parkinson’s disease affects the nervous system. Certain nerve cells in our brains produce dopamine, a chemical that works as a neurotransmitter. Among other tasks, dopamine helps to control and regulate movement. When the nerve cells break down or die, dopamine levels decrease, and this causes the symptoms of Parkinson’s disease. We don’t know why nerve cells break down, but environmental triggers and certain genetic mutations may play a role. Men are more likely to develop Parkinson’s disease than women, and the risk of Parkinson’s increases with age. Parkinson’s disease progresses slowly, and symptoms are usually very mild at first. Tremor is the most common symptom, and this is what people usually notice first. Tremor might start in one limb, or on one side of the body. Parkinson’s disease is not the only cause of tremor, and not everyone who has Parkinson’s disease experiences tremor, so it is important to see your physician if you notice any unusual health symptoms. He or she may decide to refer you to a neurologist for further examination and tests (such as checking how well your nerves and muscles are working). Physicians do not use blood tests or X-rays to diagnose Parkinson’s, but they may order certain tests to rule out other health conditions, such as a stroke. People who have very mild symptoms may not need treatment. If symptoms start to affect your daily life, your physician may recommend taking medication that increase or replace dopamine. One of the most commonly used drugs is levodopa, or L-dopa, which is converted into dopamine in the body. Drugs known as dopamine agonists mimic the effects of dopamine in the brain. Other drugs work by inhibiting enzymes that break down dopamine. Your physician may prescribe one or more of these medications to help you manage your symptoms. Deep brain stimulation is a treatment that involves implanting small wires in the brain. These wires transmit electrical signals to your brain from a generator inserted in the chest. Deep brain stimulation is most often recommended for advanced Parkinson’s disease. In addition to medical therapies, your physician may recommend lifestyle changes, such as doing regular aerobic exercise and eating a healthy diet. You may also benefit from seeing a physiotherapist, who can help you maintain your balance and mobility, or an occupational therapist, who can recommend assistive devices and assess the safety of your home. A psychiatrist or psychologist can help you navigate the complicated emotions that often accompany a diagnosis of a serious illness. A speech language pathologist can help you with voice problems and swallowing difficulties. In addition to receiving care from a team of health care professionals, you may want to explore resources in your community. For example, in the city of Edmonton, the Parkinson Association of Alberta runs a wellness program at the Buchanan Centre, including physiotherapy, speech therapy and other services. Bayshore’s commitment to supporting people with Parkinson’s disease extends beyond the centre as well. The Edmonton Branch is holding a series of fundraisers for the association, including events in Edmonton, Red Deer, Grande Prairie and Lloydminster. Visit the Parkinson Canada website to find a local office or search for education and support programs in your province or territory. Even if you’re not in Edmonton, Bayshore can help. Contact Bayshore Therapy & Rehab at 1-855-581-4746​ for more information about the services our physiotherapists, occupational therapists and speech therapists can offer. Your local Bayshore Home Health branch offers a wide range of home care services to help Canadians living with Parkinson’s. Contact us at 1-877-289-3997 for more details.